A fourth preseason top 25 is out and Indiana is again in the mix. 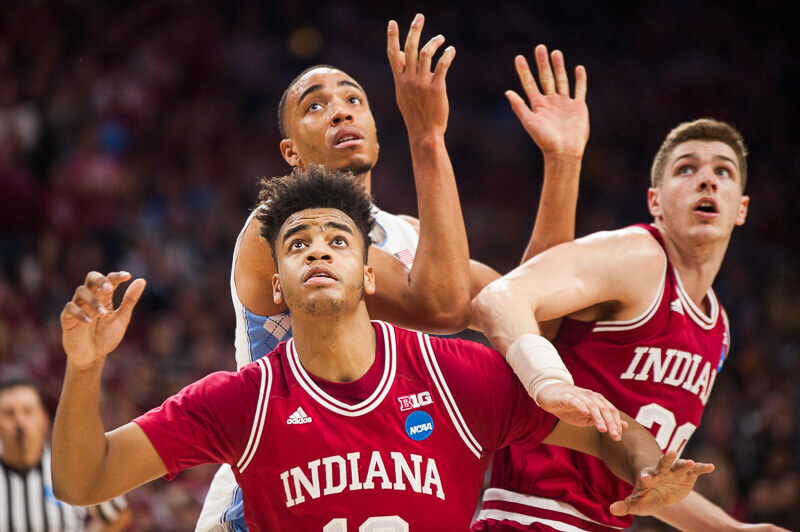 Blue Ribbon released its preseason top 25 on Tuesday and ranked the Hoosiers No. 18. Three Big Ten teams are ranked ahead of Indiana: Wisconsin (6), Purdue (9) and Michigan State (11). Maryland is ranked No. 24 preseason by Blue Ribbon. Indiana is ranked No. 12 preseason by Athlon Sports, No. 13 by The Sporting News and No. 38 by Lindy’s Sports. In August, Blue Ribbon announced its preseason All-America team, which featured Thomas Bryant, Maryland’s Melo Trimble, Wisconsin’s Nigel Hayes, Cal’s Ivan Rabb and Duke’s Grayson Allen. Kansas, Indiana’s opponent in the season opener on Nov. 11, is ranked No. 3 by Blue Ribbon. Three other non-conference opponents, North Carolina, Louisville and Butler, are ranked. The Tar Heels are No. 7, the Cardinals are No. 8 and the Bulldogs are No. 16. The Blue Ribbon College Basketball Yearbook will be released later this fall. I can live with IU at 18 to start the season. However, PUke in the top ten? And ahead of MSU? This guy was on drugs! And not the good ones! Yeah it’s laughable that they lost Hammons and Davis while still having the same questions at PG and somehow they have made a huge leap in several preseason publication rankings. What are they seeing that we can’t? Is Painter paying these magazines personally? I just don’t get it. Yeah, I can too; lot to prove. Guards (primarily JBJ, RJ, JN) need to play at or better than their recruiting rankings (20, 49, 120), OG needs to make a really nice jump, JM needs to play healthy/uninhibited (in which case he may be the biggest surprise) and DD needs to at least be an effective back-up. Naturally, If that happens, we’ll move up fast. No worries about TB or CH. Contributions by the other freshman and McFly will be a huge bonus. Don’t forget about Painter’s extension during off-season. That’s their biggest boost. LOL. Besides Perea and Hollowell, who else doesn’t play better than their rankings under CTC? Just a question. Not going to take the time to contemplate that because my comment had nothing to do with Coach. All three guards are coming off injury. I was just reminding us how talented they can be if healthy. IMO, anywhere in the top 20 is okay. 38th is just somebody standing in the sun for way too long. I know there are questions with this team because of the injuries/rehab, but there shouldn’t be any question of the improvement of players over last season. Player improvement/development has to do with the coaching staff/trainer, and IU excels at player development and body building. So, for me, no worries there. My only real concern is the player’s health and rehab. We’ve been re-assured that all the players will be ready for the season opener, so that’s a good plus. Plus the exhibitions and the cupcake portion of the preseason will give CTC the chance to monitor and regulate the minutes of all concerned. Of course, that’s a great time to get the freshmen and transfers some more minutes to get them experience at IU. All in all, concerned but not troubled. Maybe a little on the optimistic side, but I’ve been seduced by all that training video in the offseason, and how they’ve all been working really hard at it. These guys are ready! More guys who aren’t currently on the roster for one reason or another: Stan most prominently. Could make a case that neither Jurkin nor Devin Davis did, but injuries obviously got in the way. I liked what we saw from Devin during his freshman year and the reports we heard from Canada prior to the accident. Well, at the very least, these guys were bolder than the last two. Haven’t the last two had like four BIG teams within like 6 or so spots of each other? Still find the picks laughable though. Outside of Yogi we will be improved across the board while still maintaining what seems to be a strong chemistry. Too many weapons for the offense not to work, and we should be one of the best teams on the glass. I see no reason as to why, as a unit, we can’t continue to improve defensively. Nor why we can’t replicate the high 3 pt% of seasons past. If we can hit our free throws, because we will get a lot of them, and not beat ourselves up with by committing too many fouls, then I’m really liking this team. There’s too many good pieces here. Even if I was unbiased I truly don’t think I could rate us lower than co big ten champs. Stan was for the issue off the court. He played well on the court though. If I remember correctly, he was ranked 99th by ESPN’s final ranking. He was a better perimeter defender, and actually pulled some big games in B1G and the tourney. There will be an adjustment period for this team. Hard to know where to rank them before knowing how they’ll handle the loss of Yogi. But they should certainly be ranked. I think for some people, including me at least, the relative ranking compared to Purdue is the kicker. Is 18 too low for IU? Maybe not at this point (although I think it is). But Purdue ranked #9? It’s hard to account for us at #18 with what we have coming back vs. Purdue at #9 given what they have coming back. Agree about JM: people might have forgotten that JM was ranked higher than OG. Davis, based on his HS stats, should have a ton of blocks, so getting out into transition, the PGs need to be able to adjust to the speed of the game. Agreed. One note: considering how JM played with such abandon last season while hurt, I can only imagine his motor now that he’s (hopefully) recovered. My understanding of JN is that he’s nothing if not quick. I think he’s going to be one of the biggest and most pleasant surprises this season. Hope your right on DD’s rim protection skills. Lot different blocking shots in D1 ball. Hope he has a big wing span. Think alike. Hope that shoulder holds up. Have read the same thing about JN. RJ should have a good year and I expect lots of knockdown 3s from JB. Excited about this year. I think Blue Ribbon uses different criteria, but I’m not certain. However, Athlon has been consistently disregarding the Hoosiers since Knight was coach! Something I was hoping for from JN was not having to worry about ball pressure. With Yogi for 4 years I’ve somewhat forgotten what it was like to have problems bringing the ball up and getting the offense set up. I view JM as having the potential to be a Draymond Green type, kind of good at everything and a central cog to your team. I agree and in some ways I think he is already there. If he is healthy for the whole year, who knows what he could show us. We know he is tough, good defender, decent outside threat and good handles for his size. That is a great start for a freshman who played with a shoulder injury. Hahaha, what about the long IU tradition of putting Illinois fans in a deep winter depression? Champagne and West Lafayette are both gloomy, ugly campuses when the snow starts falling. Winter is coming! look at it this way, we’ll have an opportunity right off the bat to prove these guys wrong. if we beat jerKS, we’ll probly move right up into the top 10. lose a competitive game, drop back to the 15 – 18 range. get whooped, probly 22 – 25. I’m not one who would put Stan and “played well on the court” in the same sentence. He was a good defender, but nowhere close to elite to make up for his lack of offensive ability, especially as it related to shooting the ball. Totally lost his confidence with the switch to right. His case was a collective fail individually and by the coaches. No he’s not elite. Nobody said he’s elite. But he did play well in some games and proved he’s more than a solid defender. His shot was lacking, but he was able to drive and either attack the rim or create shots for teammates. He had quite a few games in B1G that logged double figure within limited minutes. He was put in late game situation against Wichita State and almost got us over the hump. I remember John Groce priased his improvement after a game against Illi. He was ranked just outside of top 100 by ESPN’s final ranking. He was underrated. Two years in ACC plus one year conditioning under Anderson, I’m sure we’ll be pleased to see him play. LOL! Great when you can work a Monty Python reference into anything!! It’s also a player like JM who goes completely unnoticed by the national press and helps explain why we could be ranked by some lower than Purdue. _We_ know he’s a very good player who can make significant contributions to a great _team_, but unless you watched him every game, you wouldn’t necessarily know that. He lit us up for 16 points and 8 assists. 🙂 He’s one of the players who I’m looking forward to watching the most. That’s an excellent point–I remember literally hoping teams would be foolish enough to press us. I’m hopeful though that we’ll have enough speed and ball handling to handle the press. Hard to make up for Yogi’s court awareness, but maybe JN will surprise us in this respect–and having TB to toss the ball to should help. He’s a pretty good ball handler for a big guy. What injury did J Newkirk have? I watched vid’s of him and he’s has a cross’over that is an ankle brakeeeer. I think he’s going to be a big surprise for us and take pressure off of RoJo. If JBJ can just continue his shooting streak from last year and is healthy plus hammer down on D. We should be pretty good at the 1&2 positions. All they need to focus on is continually looking to fee the post and don’t come down and shot the quick 3. Plus i’ve seen where several guys have put on anywhere from 10 to 40 lbs….that’s amazing in itself.